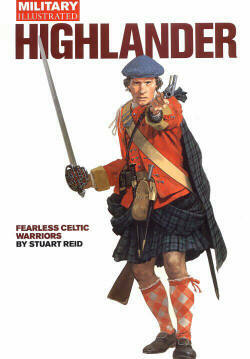 Reid, Stuart.� Highlander: Fearless Celtic Warriors London : Military Illustrated, 2000. 144 pages. 129 illus. ISBN# 1903040035. $34.95. Hardcover. Stuart Reid's most recent offering on the military history of Scotland's Highlanders is an entertaining and informative survey, but it is the Highland warrior of the 17th and 18th Centuries that is the real focus of the work.� With some six titles on Highland military history to his credit over the last ten years, the author's extensive knowledge and research are much in evidence beneath the surface of a work that positively lunges across an enormous time-span.� Yet those hoping to explore some of the tantalizing details to which he refers will have to make do with his bibliography, as it is not in the nature of Military Illustrated's format to allow for the footnotes that many might have found interesting and helpful. Sweeping forward from the earliest beginnings of an emerging Highland identity, the book's through-line is an exploration of the hallmarks of these northern warriors, especially as manifested in the romantically golden years of early Eighteenth Century rebellions, and closing with the tamed glory of Highland regiments serving Britain against Napoleonic France.� (Curiously, and perhaps owing to limited space, the reader will find only the merest allusions to the following century of Imperial service, or that rendered in two subsequent world wars. )� Given that the book opens and closes with the famous charge of the Scots Greys at Waterloo, supported by their colleagues of the Black Watch and Gordon Highlanders, Napoleonic enthusiasts will find the book to be a perceptive exploration of how the Highland regiments of the era acquired their reputations as an aggressive elite. They will also discover the characteristics (the kilts, tartans, and bonnets; and the officers' general preference for trews or trousers) that distinguished the Highlanders from the other units of the British Army. It is the nature of a book so lavishly illustrated, circumscribed in length to fit a publisher's format, and covering so much ground, to be unable to delve into a wide variety of subjects to any great depth.� Thus, Napoleonic enthusiasts will find little detailed reference to Highland service against Napoleon, although there are many gem-like observations about earlier periods that reflect upon later characteristics.� The book's examination, in a half-dozen pages, is limited largely to the Gordon Highlanders' unsung heroism at Maya (1813) and the glorious Highland charge at Waterloo.� While Mr. Reid does not allow such limitations to restrain him from challenging received wisdom when he feels it is warranted, whether regarding the origins of the kilt or the genesis and effects of the Highland Clearances, the lack of footnotes or of longer treatment can leave a reader wishing that there was more substance available on which to form a judgment.� (Presumably, if one sought greater detail on particular subjects, Mr. Reid's other books might be one place to turn. )� As an example, Mr. Reid discusses the "massive dilution of even the Scottish element in certain Highland regiments," that led to the eventual withdrawal of the kilt from six Highland regiments in 1809.� The author contrasts the 78th Foot, mustering "970 Highlanders out of a total of 1,103 rank and file two years later" (later then when is not clear, possibly after initial establishment in 1794), with the 79th Foot that "could only boast 268 Scots of any description out of 702 in 1799. "� But the full story is probably more complex and interesting, for as a glance at the appendix shows, the 78th spent two genocidally disease-ridden years in the West Indies (1795-97), after which the survivors were drafted into the 42nd Foot and the cadre went home to recruit -- it is not difficult to imagine prospective Highland recruits considering their kinsmen's fate and declining an offer that could hold a return to the West Indies. One must assume that absence of space prevented the author's fuller exploration of the subject. Highlander, is a broad survey, not a detailed study.� It brings together much information about Highlanders in one volume to provide a clear picture, in words and illustrations, of a particularly remarkable period in Scottish military history and of those who peopled it. Maps:� 12 total illustrating several Highland battles from Auldearn to Culloden. Appendices:� one appendix with six sub-sections: a general commentary on the difficulties of tracing the tangles of regimental lineage and of the evolution of uniform; four sub-sections pertain to first four major wars for which Highland regiments were raised for British service (the War of the Austrian Succession, the Seven Years' War, the American War of Independence, and the Revolutionary and Napoleonic Wars) that offer a brief description of each unit's service record and uniform; and the sixth briefly describes the Highland Fencible regiments raised for home service between 1759 and 1794. Annotated: yes, 4 are annotated. There is also a "Highlander Directory" listing re-enactment groups, museums, and historic sites.